Knowledge of primitive stone tools is vital, since one of the most important implements in a survival situation is a good cutting tool. 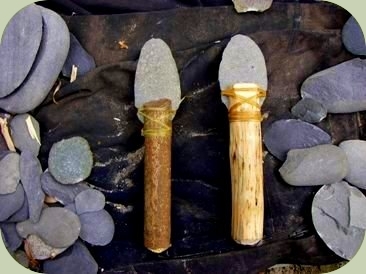 If you were to find yourself without a knife, a stone cutting tool can be created from rocks. 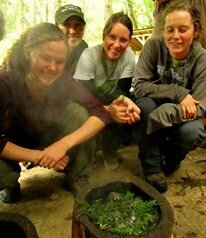 The first step to creating useful primitive stone tools is selecting the best-suited material. A riverbed or creek can be a great place to search for the proper stones. Rock bash is the rough technique of striking one rock into another with great force and seeing what kind of edges/blades might break off. This can be a good way to make your first break into a stone, so that finer work can then be done with other methods such as percussion flaking. Be careful, as this is the least controlled and therefore most hazardous technique. Bi-polar percussion consists of carefully striking a hammer stone directly on top of your subject material while it is placed on an anvil stone. This oftentimes splits the subject material in half, producing two usable edges. This is a very efficient way to create a quick stone tool. "Skipping stones", rocks that are flat with rounded edges, are easiest to break apart using bipolar percussion. Percussion flaking consists of using a hammer stone (or heavy billet) to strike the edge of the subject material to break off flakes. This is a controlled method for shaping an edge on a stone. Many rocks are difficult to effectively percussion flake because they are either too brittle or dense. The best materials to percussion flake are flints, cherts, obsidians, and glass. IMPORTANT: Please exercise caution when breaking stones apart. Small shards can project out in any direction. Eye protection is essential. Long-sleeve shirts, pants, and gloves are also recommended. 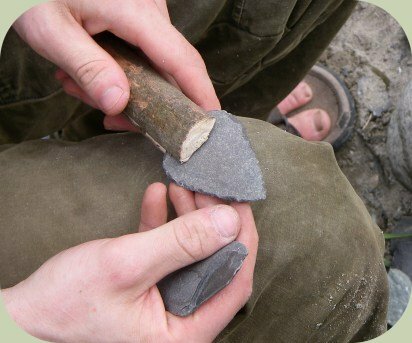 By utilizing the above techniques, you can quickly create a stone tool to aid in a wilderness survival situation. Happy rock-breaking!